Today we’re sharing a story we wrote for another website back in 2014. It’s about a coachbuilding company from Mexico called DM Nacional and it has been one of my favorite research projects over the past decade and more. We recently found one of the five cars they built and we’ll share more about that in the future. 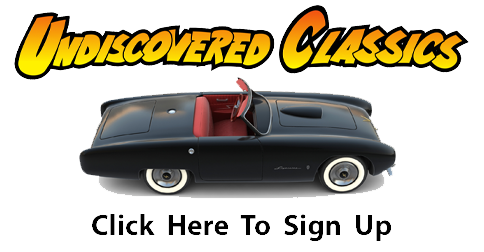 For now, we hope you enjoy our first story shared on Undiscovered Classics about DM Nacional cars, and we look forward to sharing more stories in the future. Have fun and we hope you enjoy. 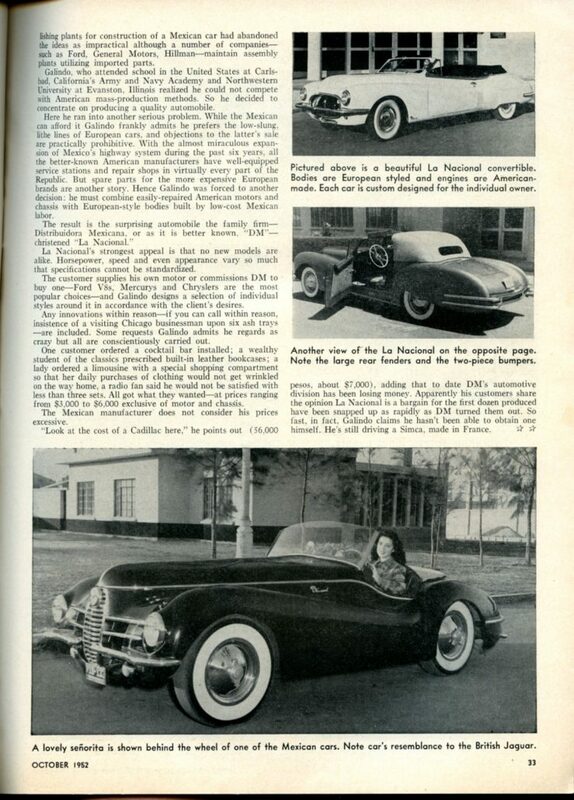 Here’s a car manufacturer – DM Nacional – that I’ve been researching for nearly 8 years – tracking down stories photos, and even the original designer of one of the cars too – Mark Wallach – who is 89 years old this year (Great thanks to Jim Sitz for helping track down Mark) And what makes this story even more interesting is that the company was based in Mexico – unique among custom and sports car builders. Recently, I was able to talk with and begin working with the grandson of the founder of DM Nacional– Antonio Ruiz Gallindo. Antonio has been kind enough to encourage our research efforts and help share family knowledge of the cars too. 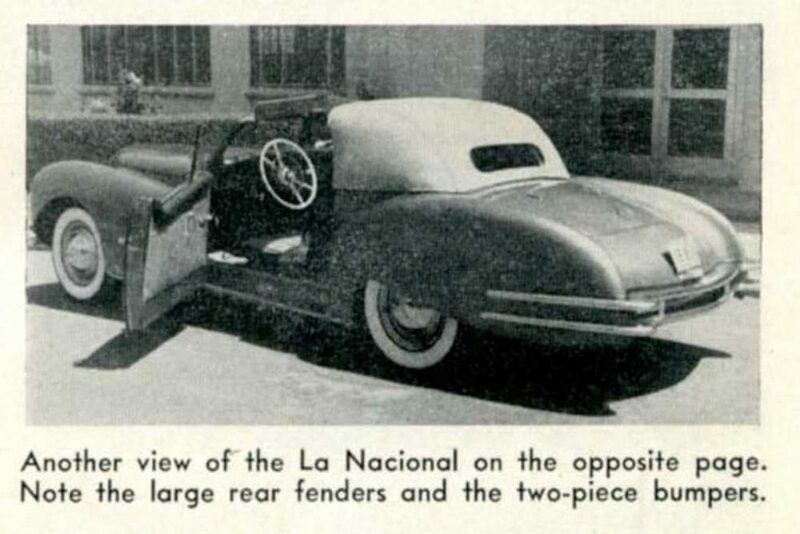 DM Nacional cars were special cars – hand built and/or customized and some having coachbuilt bodies that were completely original in their design. 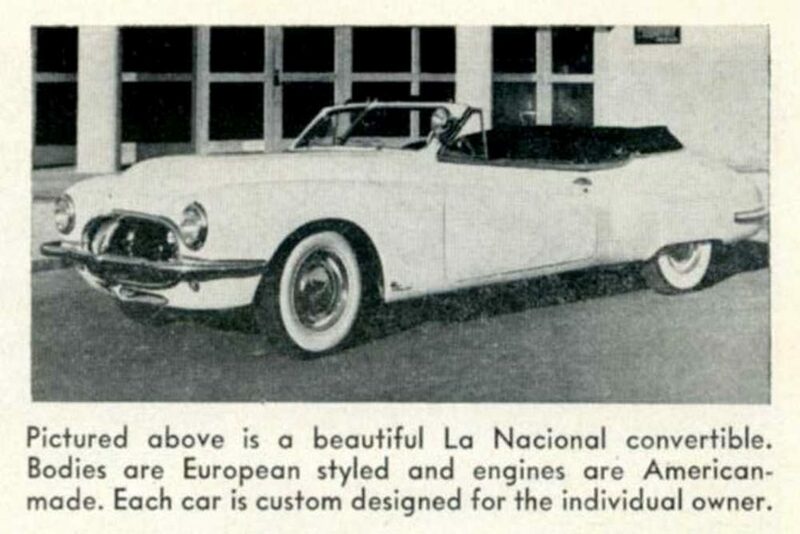 DM Nacional built automobiles for approximately 5 years (1950-1955) and produced custom cars, sports cars, and sport custom cars – something for everyone’s taste and each one an individualized design. 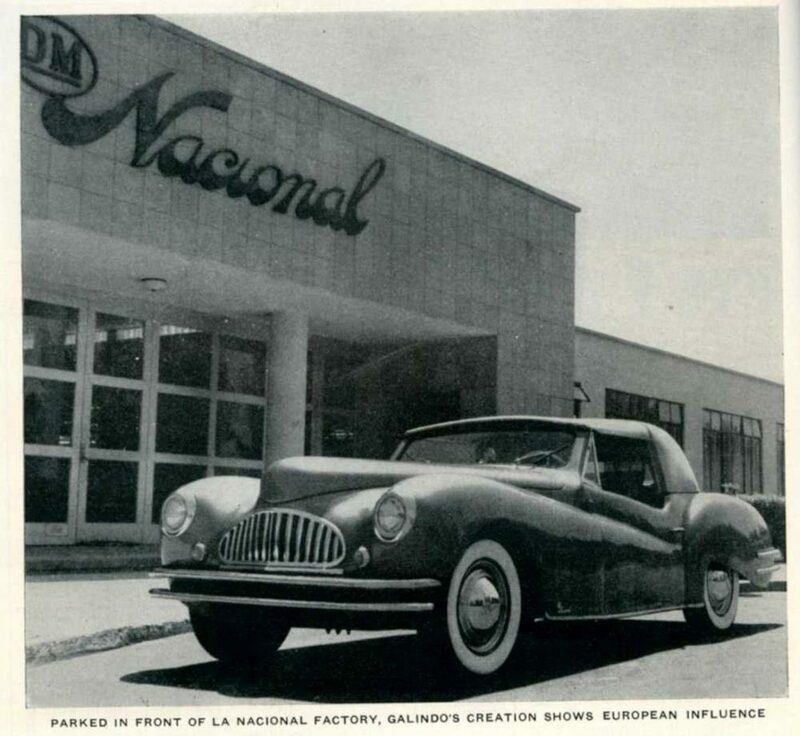 In many ways, the story of DM Nacional parallel’s the story of Spohn in Germany who designed and built custom cars for mostly the American GI/military market. American GI’s would have their cars designed and built while stationed overseas (mostly in Germany) and ship them stateside at the end of their tour. Only two companies did this type of work that were located overseas. That is, built what we would consider custom cars in limited numbers for the American market – Spohn and DM Nacional. Let’s review a nicely detailed article from Speed Age about DM Nacional – published in 1952. Specialists who demand something really different in an automobile will do well to look south of the border where young, dynamic, U.S. educated Ruiz Galindo Jr. is pioneering the production of Mexico’s first automobile. No engineer, but as he puts it, an amateur who is in love with fine automotive styling, Galindo was so impressed by the eye-appeal of French and Italian cars during a trip to Europe several years ago that he immediately began to dream of a similar Mexican industry. Unlike most dreamers, his financial position was such that he could convert his dream into reality. His father, former Economic Minister of President Miguel Aleman’s regime, owns a $15,000,000 furniture factory in the shadow of Mexico’s famous Shrine to the Virgin of Guadalupe; he himself is an assistant director, and a brother, Armando, is general manager. As a result, some of Mexico’s most modern machinery and most-skilled labor was at his command at much lower cost than in Europe and the United States. 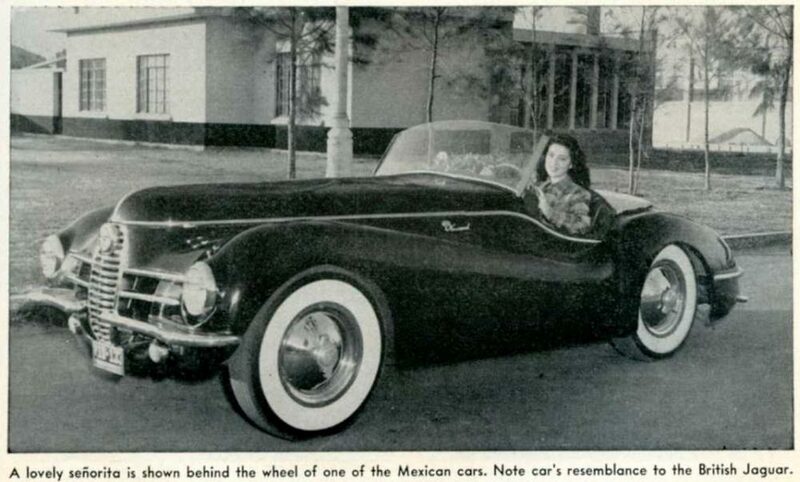 Nevertheless, so formidable were the natural obstacles that many foreign firms which had studied the possibility of establishing plants for construction of a Mexican car had abandoned the ideas as impractical although a number of companies – such as Ford, General Motors, Hillman – maintain assembly plants utilizing imported parts. Galindo, who attended school in the United States at Carlsbad, California’s Army and Navy Academy and Northwestern University at Evanston, Illinois, realized he could not compete with American mass-production methods. So he decided to concentrate on producing a quality automobile. Here he ran into another serious problem. While the Mexican can afford it Galindo frankly admits he prefers the low-slung, lithe lines of European cars, and objections to the latter’s sale are practically prohibitive. With the almost miraculous expansion of Mexico’s highway system during the past six years, all the better-known American manufacturers have well-equipped service stations and repair shops in every part of the Republic. But spare parts for the more expensive European brands are another story. 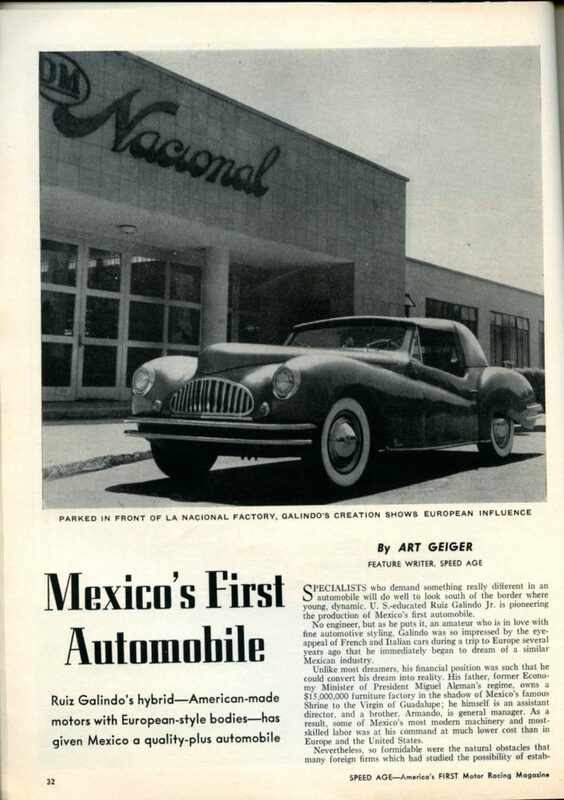 Hence Galindo was forced to another decision; he must combine easily-repaired American motors and chassis with European-style bodies bult by low-cost Mexican labor. The result is the surprising automobile the family firm – Distrubuidora Mexicana, or as it is better known, “DM” christened “La Nacional.” La Nacional’s strongest appeal is that no new models are alike. Horsepower, speed and even appearance vary so much that specifications cannot be standardized. The customer supplies his own motor or commissions DM to buy one – Ford V8s, Mercurys, and Chryslers are the most popular choices – and Galindo designs a selection of individual styles around it in accordance with the client’s desires. Any innovations within reason – if you can call within reason insistence of a visiting Chicago businessman upon six ash trays – are included. Some request Galindo admits he regards as crazy but all are conscientiously carried out. One custom ordered a cocktail bar installed; a wealthy student of the classics prescribed built-in leather bookcases; a lady ordered a limousine with a special shopping compartment so that her daily purchases of clothing would not get wrinkled on the way home, a radio fan said he would not be satisfied with less than three sets. All got what they wanted – at prices ranging from $3000 to $6000 exclusive of motor and chassis. The Mexican manufacturer does not consider his prices excessive. “Look at the cost of a Cadillac here,” he points out (56,000 pesos, about $7000), adding that to date DM’s automotive division has been losing money. Apparently his customers share the opinion La Nacional is a bargain for the first dozen produced have been snapped up as rapidly as DM turned them out. So fast, in fact, Galindo claims he hasn’t been able to obtain one himself. He’s still driving a Simca, made in France. So…this is our first “salvo” on a story about DM Nacional, and expect much more information to be posted on this company in the coming months. Posting of photos of cars built and the stories about them, and interviews with Mark Wallach who was brought down from Los Angeles, California and designed the first DM Nacional sports car will be shared too. 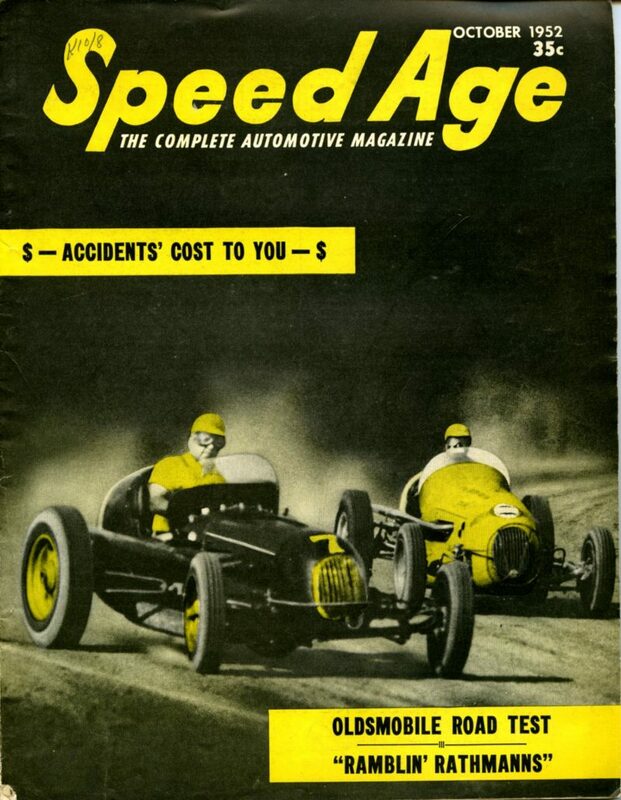 And..interviews with the Gallindo family, and more about each of the cars they built. DM Nacional has an amazing story to tell – something that has not been shared in detail for over 50 years. And we’re honored to share it here at our website. Absolutely fascinating stuff! Thanks for all your hard work, Geoff!